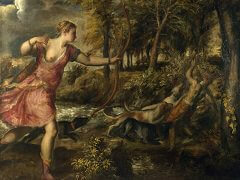 During his early period - when he painted The Pastoral Concert - Titian was strongly influenced by Giorgione. His art later reached its fullest expression in paintings which blended classical rigor with the effects of "chromatic alchemy." 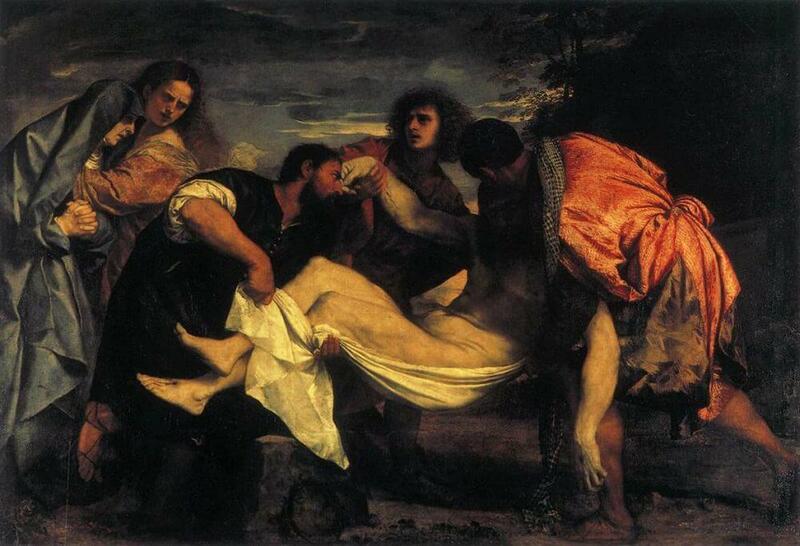 In The Entombment of Christ, which he painted for the Gonzaga of Mantua, Titian heightened the dramatic impact with a twilight glow that adds warmth to the flesh tones, while the pale figure of Christ is hardly visible in the shade. Pontius Pilate has granted Joseph of Arimathea permission to take Christ's body down from the cross for burial. He is aided by Saint John, who is holding Christ's hand, and by Nicodemus, with his back to us. He is enveloping the body in a white shroud before it is taken to the tomb. 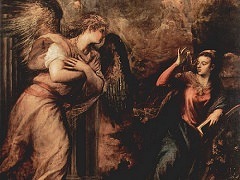 The Virgin Mary is present, supported by Mary Magdalene in her grief. 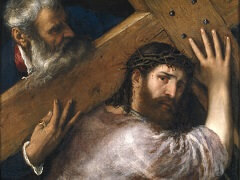 The entire composition of the painting is defined by the horizontal line of Christ's body. The frieze format follows this line, focusing our attention on the monumental figures grouped around Christ, all in the same perspective. 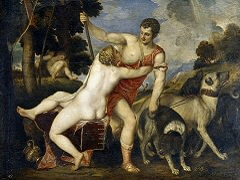 This striving for balance marks a new departure in Titian's career. He has not hesitated to limit the space of the scene and simplify the subject to produce a work of remarkable classical rigor. 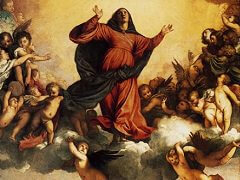 Titian returned to the theme of suffering and death on several occasions. In this instance he produced a work of great yet restrained emotion. The dim light of dusk plays a major part in the atmosphere of the work, heightening the dramatic tension of the scene by creating alternating zones of shade and light filtered through storm clouds. For example, the lower half of Christ's pale body is brightly lit from the side, while his face and torso are in Nicodemus' shadow. The unified light allows the artist to produce chromatic transitions of great delicacy, which here and there give the impression of warm colors and gilded reliefs. 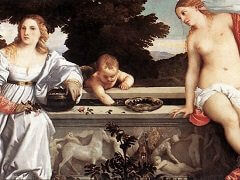 The painting was originally in the ducal palace in Mantua. It may have been painted in around 1520 for Isabella d'Este or her son Federico II Gonzaga. The family of the dukes of Mantua were among the most illustrious patrons of the arts of the Italian Renaissance.